Immerse yourself in Japanese culture on a private, 4-day tour of Tokyo and Kyoto. Visit both modern and ancient attractions with a guide, exploring each city for two days by bike and on foot. In Tokyo, feast Izakaya-style, enjoy sake tasting, try fresh sushi at Tsukiji Market and bicycle to the sumo area of Ryogoku. Then travel one-way by Shinkansen bullet train to Kyoto, where you’ll view gorgeous temples and shrines as well as discover the highlights of Gion – Kyoto’s famous geisha district. When you arrive in Tokyo, check in to your hotel any time before your group meeting at 4pm. Your guide will lead your small group on a two-hour night tour of Tokyo on foot. Walk to the popular Shinjuku or Shibuya neighborhoods to find Tokyo’s young people enjoying the lively atmosphere and local nightlife. Next, head to a local karaoke bar for a chance to sing your favorite tunes in a private room with your companion(s). Stay for an hour, or longer at your request, enjoying your choice of songs and a set number of beverages (karaoke and drinks at own expense). 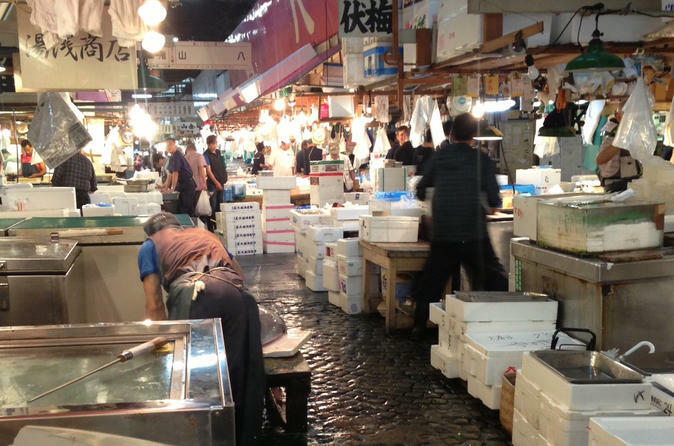 Take a private food tour of Tsukiji Market – the largest wholesale fish and seafood market in the world – and watch fishmongers selling the morning catch, following sushi breakfast. Before your exploration, seat yourself at a counter and observe expert chefs prepare mouthwatering local sushi like maguro (yellowfin tuna), ikura (salmon roe), ika (squid) and more! When you’ve had your fill, follow your guide through a maze of some 1,700 stalls and learn about Japan’s fascinating market culture as you watch shoppers inspect row upon row of seafood. Then continue on a tour of Tokyo's highlights, passing Hamarikyu garden, Ginza walk, Meiji Shrine, and Harajuku. Afterward, try your hand at Japanese calligraphy during an informal private lesson offered by your guide. Return to your hotel and recharge your energy for the next day!